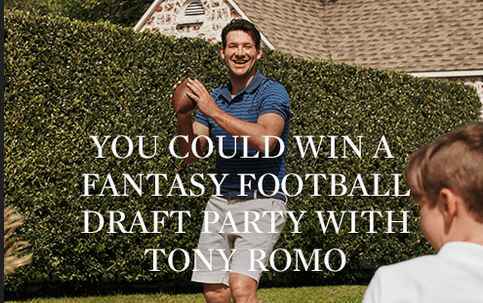 If you want to do a Fantasy Football Party With Tony Romo & Chaps then enter the Chaps Ultimate Draft Day Sweepstakes now through July 13, 2018 for your chance to win a unforgettable trip for four (4) to Dallas, TX. Trip Package Includes: round trip, coach-class, Hotel accommodations, $1,000 spending money, $50 Kohl’s gift card and more. Visit this link:Chaps.promo.eprize.com/fantasyfootball to go to the sweepstakes page. ONE (1) GRAND PRIZE: A trip for four (4) to Dallas, TX. Trip package includes round trip,coach-class air transportation for four (4) from a major airport near winner’s home (determined by Sponsor in its sole discretion) to Dallas, TX; two (2) nights’ accommodations at a hotel determined by Sponsor in its sole discretion (two rooms, double occupancy); Tony Romo appearance to manage draft order(determined by Sponsor in its sole discretion); $1,000 spending money; and travel agent services. When To Enter: The Chaps Ultimate Draft Day Sweepstakes begins on June 9, 2018 at 12:00 a.m. Eastern Time (“ET”) and ends on July 13, 2018 at 11:59 p.m. ET. Sponsor: Ralph Lauren Corporation, 650 Madison Avenue, New York, New York 10022.